Looking for earthy 808 bass samples that hit you in the chest? Hate being confined to your standard bass sounds? The 808 has proved to be the long lasting legacy of the Roland 808 drum machine, and when used in conjunction with live hats and snares you can create some seriously tasty beats! We’ve found 5 of the best 808 bass packs that will open up a world of opportunity in your productions, from dubstep to hip hop, R&B to techno. 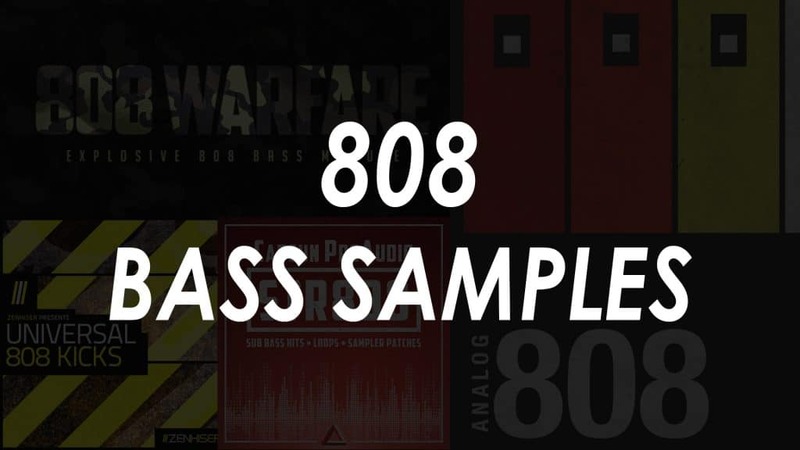 Below is a short list of the 808 bass sample packs we talk about in this article. Scroll down for more details or click for audio demos. Comprising of both tuned samples and huge bass drops, the Analog 808 pack by Modern Samples have been recorded solely through analog gear. This conviction to the recording process ensures the highest quality sounds, keeping the bass sounding true. There’s 212 tuned samples that all have varying texture and color, and 35 bass drops for taking your track from big to huge! All of the samples are organized into the standard Falling 808s, Long, Medium and Short, and they’re fully mixed and ready to go, so ease of use has been nailed. You can have these sounds in your mix within minutes following the instant download. The extensive range of analog gear used on Analog 808 is what has given this pack its great variety of sounds. Warmth, depth, and texture have been added using a vintage Neve 1073 preamp and EQ, and body and fullness came from the Tube-Tech CL1B compressor. For the more extreme sounds, an Empirical Labs Distressor was used to increase note sustain, emphasize the punch and add multiple flavors of distortion. With some of the industries finest recording gear used to record Analog 808 and a massive selection of samples, the $37 price tag is very reasonable both for the quality and value you receive in this pack. Certainly worth the attention of anyone serious about huge 808s! For the producers using the Kontakt platform to produce their tunes, The Producers Choice has something special just for you! They’ve put together a library of 808 basses mapped across the keyboard and tuned perfectly. The benefit of a Kontact library is that you can leave your midi notes in place, and switch patches until you find an 808 that fits perfectly into your track. The Urban 808 Kontakt Library comes with 20 808 samples, all based on the Roland TR-808 but then uniquely processed to give each sample its own character. The processing and mixing of the sounds guarantee there’s no pops, crackles, unwanted noise or silences, just ready to rock, professional 808 basses. Despite having far less selection than the 3 packs we’ve already covered, the Urban 808 Kontakt Library still has a vast range of 808 sounds available. The 22 styles include hip hop, clean, gritty, dirty, distorted, punchy, compressed and monster to name but a few. As a bonus, there is a 23rd instrument included, which has 808 claps, snares, toms, cowbells, hats and more. 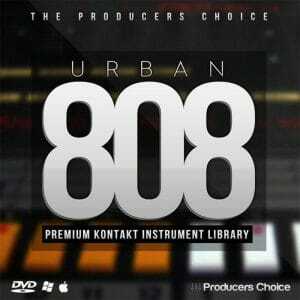 Currently, the Urban 808 Kontakt Library is being offered at $35, which is a saving of $15 on the RRP. At this price, it’s unquestionably something anyone using Kontakt to make urban music should be looking at. Despite what would seem like a lacking in samples compared to the other packs we’ve discussed, the fact this is set up correctly for Kontakt means there is so much freedom that can be employed. You can use the samples as they come, or you can tweak things such as the legato, amp release and fade. This is all supported by top quality, thick, punchy samples that you just can’t go wrong with! A full version of Kontakt 5 is required to use Urban 808 Kontakt Library, so don’t be too hasty in purchasing if your software isn’t up to standard! As a follow up to the Urban 808 Kontakt Library, The Producers Choice developed an extended 808 bass collection with 808 Warfare! 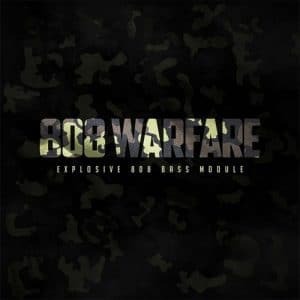 If you liked the sound of the Urban 808 Kontakt Library but aren’t familiar with Kontakt, or you’re highly proficient using different software, 808 Warfare could be for you. Comprising of 169 WAV samples, there’s plenty for everyone, but 41 Kontakt patches are also included for those who prefer to use the NI software. With a straightforward and practical interface, 808 Warfare offers the same ease of use as Urban 808, just swap your patches around until you’re satisfied with your low end. Once again, the whole pack is mapped to be perfectly pitched on the keyboard and polished with EQ, compression and transient shapers to ensure quality. Finding an 808 sample that fits your genre and mix, but also cuts through with the desired punch is no problem with 808 Warfare. These sounds can be pushed to their limit while holding their integrity. The RRP on 808 Warfare is representative of how vastly extended it is compared to 808 Urban, and its superior compatibility; $107. But the great people at The Producers Choice are offering it for just $47! So if you’re a Kontakt pro and can spend an extra 12 bucks on almost double the patches that Urban 808 offers, or if you don’t use contact and want some solid WAV format samples, take a look at 808 Warfare! 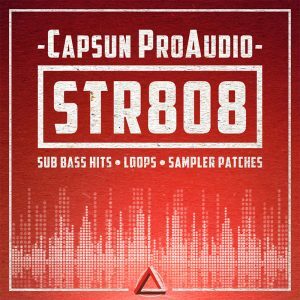 Capsun ProAudio’s STR808 collection is formed from 50 newly designed one shot samples, all in 24bit WAV quality. Across the 50 samples, they have tried to include tones and flavors for every mix including analog warmth, grimy distortion, clean tones and saturated trap subs. All the samples in STR808 have already been pitched and tagged to their root key, along with being rigorously mixed. Transient shaping, EQ, saturation, and other processing have all been carried out to ensure every single sound is ready to use from the moment you load the sounds! Along with the one shot WAV samples, each sound is included as a soft sampler for Kontakt, NN-XT, Ableton Simpler, and SFZ, making it even easier for users of those platforms to get stuck in. But if you’re feeling like inspiration is eluding you, this 808 bass kit has you covered. 100 sub bass loops are included to get your track off the ground, all tagged with root key and tempo. Genre isn’t an issue here either, the loops range from 80bpm to 160bpm, so whether its lo-fi hip hop or dark drum & bass, there’s a loop here to spark the imagination. To appeal to those just getting started, Capsun ProAudio has thrown in a bonus 16 hit drum kit, so the STR808 could be all you need to get started. The kit is mapped for Ableton Drum Rack & Reason Kong with an additional 10 bonus loops in WAV & Rex2 format. At a price of $19.26, the STR808 collection offers great value for money. Probably more suited to beginners and intermediate producers, the STR808 has a lot to offer for those starting out or looking to up their low-end game. Having already released a full 808 drum pack, TR-808 The Drum Machine, Zenhiser has now turned their attention to focusing just on 808 bass samples. What they have produced is a pack of 300 unique samples ranging from subtly pushed sub kicks to overly saturated monster bass sounds. With a huge selection available, there is a sample for every genre including trap, hip hop, drum & bass, EDM, progressive house, trance, techno, and hardstyle. As with the Analog 808 collection, Universal 808 Kicks is separated into folders, but this time there are an additional 2 on top of the original 4. Along with the short kicks (fast attack, heavy bottom and a fast release, more suited to trap and hip-hop), there is also ‘short layered’ which have been designed to have a bit less sub harmonics, with a heavy body and a sharp attack click layered over. These kicks have been formulated with the EDM, Progressive House & Trance producers in mind. As standard, there is then also medium, long and falling folders. Musically, the medium would be most commonly utilized, with super warm lower frequencies, more depth and little more length than the short kicks. The long and falling samples would be most likely used for specific purposes. Zenhiser has also introduced a standalone FX folder, for the hardstyle and hard techno producers, where the sonic range and possibilities are truly unleashed! 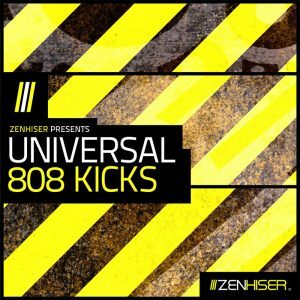 At $30.85, Universal 808 Kicks packs a whole lot into 1 product, making it great value for money. Aimed more towards intermediate to professional producers who are well-versed in creating their beats and are now refining their sound, but who are wanting a diverse selection of kick sounds and freedom to craft their tracks to perfection. Your bass is the foundation of any track, and no producer can afford to overlook its importance. We’ve covered 5 of the best 808 bass packs, all of which offer the kind of quality you’re going to need to lay solid foundations on which to build a strong track on. 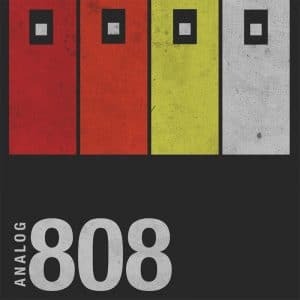 Though all the 808 bass sound kits we’ve featured are great, if we had to pick one, we’d go with Analog 808. Though the samples aren’t designed for VST software like Kontakt, all the samples are labelled with their root key, and they can all easily be added to a piano role or pitched up an down with a filter. It’s mostly the quality and character that we appreciate here, with 100% of the samples utilizing some of the best analog recording gear, it’s hard to find 808 sounds produced with such intent of quality. So now that you have a great selection to choose from, there should be no excuses why your beats shouldn’t be rattling your neighbors windows.